Behemoth, by Scott Westerfeld, is the second book in the Leviathan Trilogy. I reviewed the first book, Leviathan back in January of this year, and the third book in the series, Goliath, will be released on September 20th, just two short weeks from now. Behemoth picks up where Leviathan left off. 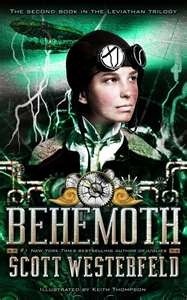 Deryn Sharp is a girl acting as a boy midshipman on the airship Leviathan, a strange beast of a craft, filled with other strange beasties, like shrapnel toting bats and hydrogen sniffing dog-like creatures. The Leviathan is a war ship, smack dab in the middle of the beginnings of a war between the British Darwinists and the German Clankers. And on the Leviathan is a boy prisoner with a secret of his own. Alek is the son of the deposed Austrian Archduke, and heir to the Austrian Empire. At the end of Leviathan, the damaged ship is drifting southeast from Austria, and heading towards the Mediterranean, where another battle is about to take place. A neutral Empire is being coerced into taking sides in the coming war, and Alek and Deryn hold keys to determining which side it joins. I’m assuming at this point that you have already figured out that this is not a Tom Clancy thriller. This is steampunk, alternate-reality history and if you pick it up, you had better do it with an open mind. There is some crazy stuff happening in this book. The machines are massive. The world is darkened by the soot of an over-industrialized world, and man has tampered with nature in ways no one could imagine. Okay, one person has imagined: Westerfeld. The book is boy adventure at it’s best, and for a large part of the story, I forgot that Deryn was actually a girl. The action through most of the book is fast and furious, and the plot very, very well done. Lesser authors might throw in steampunkish devices that have little to do with the plot, and call it steampunk. But Westerfeld weaves the world of the Darwinists and the Clankers in to every scene, where you can’t really imagine this world without all the strange vehicles and creatures. There were a few times where I wondered why no one saw that putting a freaking wheel on something wouldn’t be more efficient, but Westerfeld is consistent in how he builds the world, and you just begin to assume that that is the way it just has to be. This book seems to have a faster pace than Leviathan, probably because he doesn’t have to cover quite as much backstory, and the characters are already in conflict from day one. If you’re a steampunk fan already, you’ve probably already pre-ordered Goliath. If you’re just getting started in the genre, pick up Leviathan and this one at the same time. You won’t be disappointed.